Prime Minister Narendra Modi has sought Israel’s help in containing terrorism and extremism from Pakistan even as he vowed to expand defence and security ties during his meeting with the President of Israel Reuven Rivlin. “President Rivlin and I deeply value our strong and growing partnership to secure our societies. Our people are constantly threatened by forces of terrorism and extremism. We recognise that terrorism is a global challenge, knows no boundaries and has extensive links with other forms of organised crime. Regrettably, one of the countries of its origin and spread is in India’s neighbourhood,” Modi said here on Tuesday. 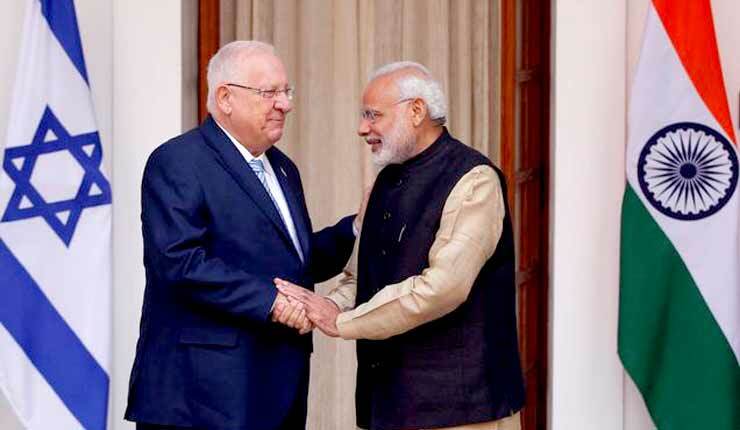 Modi said he and President Rivlin have agreed that the international community must act against terror as well as against states that encourage them. “We noted the strength of our growing defence partnership. And agreed on the need to make it more broad-based through production and manufacturing partnerships,” he said. Modi added that the Israeli President has also assured support for India’s membership in the UN Security Council (UNSC). President Rivlin, who is on a week-long visit to India, is the first President from the Jewish country to visit India in the last 20 years. His visit is expected to pave the way for Modi’s trip to that country early next year, when both sides would commemorate 25 years of diplomatic ties. The PM also asked Israel to invest in India under Make in India, Digital India, Skill India and Smart Cities, for high-technology manufacturing and in the services sectors. Israel has engaged with India in agricultural and irrigation systems in drought-prone areas for effective water management. “We have identified water management and conservation, and collaboration in scientific research and development as two areas of priority engagement. We both agreed that the current trajectory of the Indian economy opens up many promising opportunities for Israeli companies,” he said. President Rivlin, who arrived here late on Monday night, will be visiting Agra to see the Taj Mahal on Wednesday. He will also be visiting a water treatment plant in nearby Sikandra. On Thursday Rivlin will again address think-tanks and sign agreements on education. He will also be visiting Karnal and Chandigarh. Next week he would hold business meetings.